There's this brilliant competition going at the moment that's run by TravelSupermarket.com. 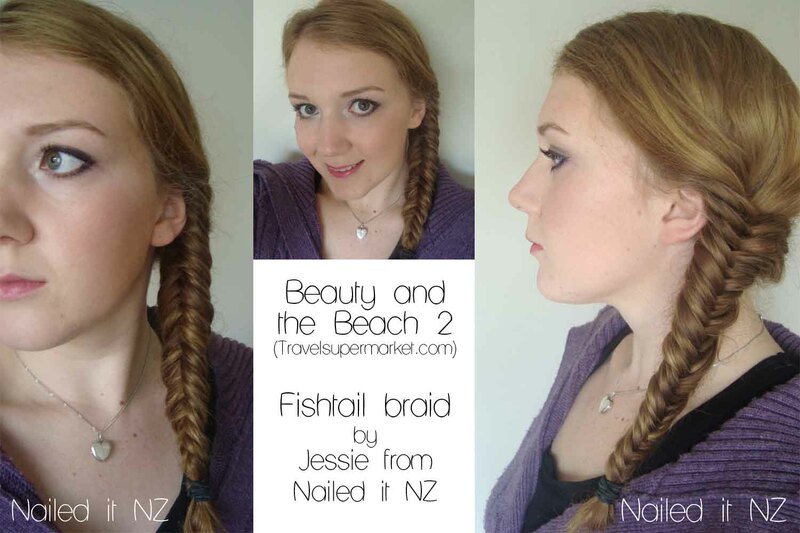 It's for beauty bloggers - you need to design your ideal holiday nails, hair and/or makeup. There are amazing cash prizes up for grabs! From what I understand, if you win one of the categories you'll get 500 pounds - that's over 900 NZD! If you're the overall winner, you get 1500 pounds. That's some serious fainting material right there. If you have a blog and you're interested in entering, head over there by clicking here! I thought really hard about this, and it was actually really stressful trying to make the design work! There's so much more pressure on when you know it's going to be judged - I feel sorry for the people entering my competition now! "We are challenging bloggers to showcase their talent by posting a blog post that captures what they think is the perfect holiday hair, nails and make-up. It is entirely up to you whether you consider this look to be minimal and natural for lazing on the beach, or exploring a city's sites, or whether the perfect holiday look is glamorous evening hair and make-up for dining or clubbing." Right, so what you'd wear on holiday. This posed a problem for me though - I wear anything on my nails, all the time! I'm quite happy to have floral in winter and bunny nails at Christmas-time and so on. So I decided to paint my nails in a way that represented what holidays are to me (hair and makeup to come!). I thought about what the common kinds of holidays are, and came up with visiting beaches, going camping, shopping and specific destination holidays. Then I thought about what holidays should mean to you, and how you should enjoy them. That gave me the phrase "live, laugh, love." Great, now I had an idea. Pulling it off was a lot harder. It actually took me two days to completely finish these nails. I hated what the now-blue gradient nails looked like beforehand, so I took them off and tried again. I'm still not 100% happy with them but I gave it my best shot at least. My left hand showed camping in the forest (camp-fire and all) and a woman shopping. The latter is definitely one of my favourite things to do on holiday! The right hand actually turned out better, which is unusual as I'm definitely not left-handed! On the pinky I painted on the Eiffel Tower, and then a beach scene on the middle finger. On both hands I used clear glequins on the index finger to create a bit of texture - it kind of reminded me of the sparkling of clear blue sea water. I added one rhinestone at the top of the nail to help bring the design together. On the ring fingers of both hands I carefully painted on the phrase "live, laugh, love" as I think they are three things that are important to do on holiday! On the thumbs I alternated between silver and blue rhinestones to make a smart line down the centre. On to the hair! I'm not that good at hair, but one of my good friends and I have been practising a lot! She's brilliant, does five-strand braids and everything else with ease! I'm a bit slower and am only just mastering french braids. Even then, I thought they were too complicated for a holiday/beach look (haha, such a hypocrite with the nails though...) so I went with a fishtail! I only started doing these a short time ago, but really like them. Mostly because they're so simple, but look awesome! They do take longer than the basic plait, but when you're on holiday you tend to have a lot more time on your hands :). I used quite large bits of hair to do this, but you can use thin bits too - depends how you like it! If you don't know how to do these, it's really easy. Here's a good YouTube tutorial to show you how! And lastly, the make up. Oh dear, I'm not so good at make up. Earlier this year I was wearing bronzer on my cheekbones, and looking at photos from then I am SO embarrassed! I've been watching a lot of YouTube tutorials over the last few months though - Shaaanxo and Zoella are my favourites! So while I'm still a newbie, I'm not as completely lost as to what to do with it all. I went for what I imagine to be a semi-natural look. I think. God I'm bad at this. Jeez, those names... I thought nail polish was bad at dragging them out! I'm not really sure how to describe how I did it. I just... put them on my face. Man, I sound like a little kid. To be honest, if I can do it anyone else can, so if you want to recreate it, go for your life! So that's my entry! On a side note, it was mine and Chris' four year anniversary yesterday! Well, it's our "going out" anniversary anyway, we like to celebrate both that and our wedding one because hey, twice as much fun! 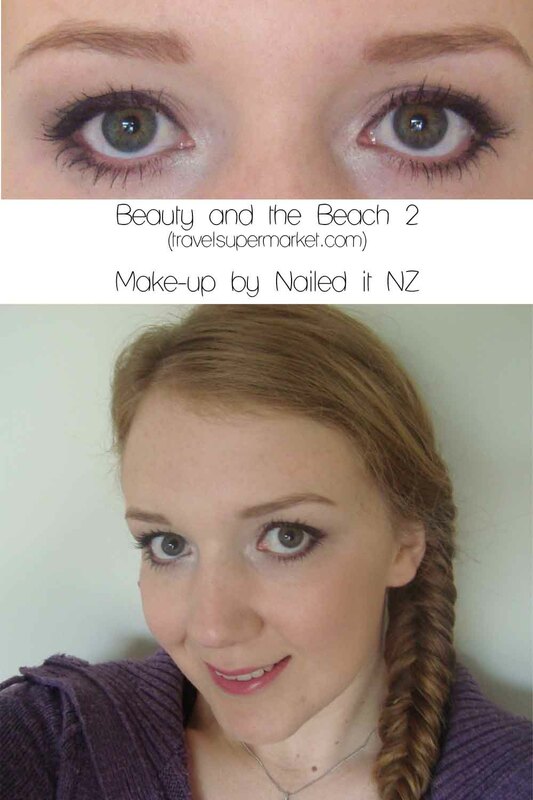 P.S - I find it slightly ironic that this post is called "Beauty and the Beach" while my last post was "Beauty and the Beast!" Woah you must win with this!!! I hope it, really, i'm sure you deserve it!! I dont know what is the best hand, both are fabulous!! Good luck with that, okay?